Ich skate, also bin ich. mag. Ich dachte dahinter muss jemand mit Herz und Seele stecken und hakte nach. Legenden Big O, The Ranch, Marina del Rey usw. gesehen hat. I had to rethink this sentence when I first stumbled across Xavier Lannes`blog. It is one of the blogs I visit almost daily as it is very up to date and covers the skateboarding I like. I thought there must be someone with heart and soul behind it and researched. Xavier is a skateboarder from the start and has lived through all the ups and downs over the decades. Today he is living in California following his dreams and skating the new parks after he has seen all the legendary ones like Big O, The Ranch, Marina del Rey etc. "I started skateboarding around 1965. I frankly don’t remember the year. We were sharing the same skateboard with my father and we would go skate every other week-end. I had no idea skateboarding was popular in the US at that time. I never knew it stopped either… We skated with my father sharing the same board until about 1970. Then my father bought 2 extra boards, one for me and one for my sister. Skateboard was a family thing. After that, he bought several more boards and we started to compete against friends at school (with the boards I would lend them). It was nothing more than a pastime for kids until we discovered the Cadillac wheels. That’s when it started to become serious. The wheels were sticking to the road and I would make radical maneuvers and turns. That was amazing. I almost instantly loved slalom because of the wheels’ traction. 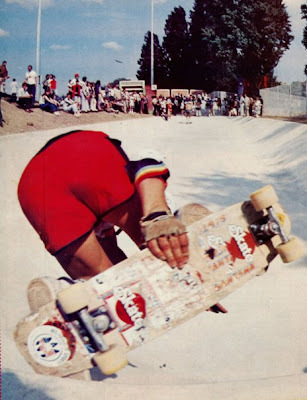 In 72-73, I met Thierry Dupin at Biarritz and he introduced me to J.P. Marquant, the boss of Banzai Skateboards, I turned pro, went to a lot of contests (in France, Italy, Switzerland, USA) and even won a lot of slalom contests. I also entered freestyle contests and was regularly in the top 3… For the following couple of years we toured with the Banzai team in France, Switzerland, and Belgium. 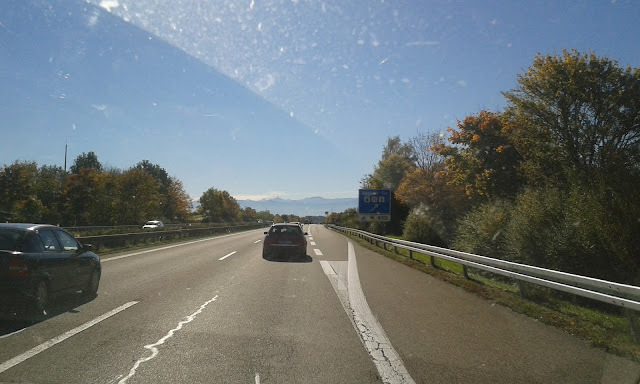 Then I left the Banzai team and became independent professional and toured in France and Spain. At the same time I started to write for Skate France Magazine and became addicted to vert. Skate France Magazine lasted almost 3 years until the mag went broke. I wrote between 40% and 60% of the mag’s articles in every issue of Skate France until the last one, except for the very first issue. When Beton Hurlant (Paris) opened I was at the skatepark almost every day and trained more on vert and less on slalom. I finally left competitive skateboarding (and slalom) in about 1981 when skateboarding died completely in France but I was still skating alone in abandoned half pipes and dirty parks. I’ve now been back on a skateboard for almost two years. I skate only mini-ramps and bowls. Mainly at Jurupa, Belvedere, Etnies, Venice, Volcom and Vans. I started blogging about skateboard two years ago, but the blog really started to have traction last November 2010. The blog is specialized in vert/bowl/ramp/pools but I sometimes talk about the skateboard industry as well and more rarely about street. Yeah, there’s been ups and down, but that’s true; from 1965 to 2011: skate for life!" Tu es un modèle ! "and he's looking good ..."